Candy Mountain | WHAT A FEELING! “The road is gonna eat you up, man,” says the minor rock star to the slicked-back kid. 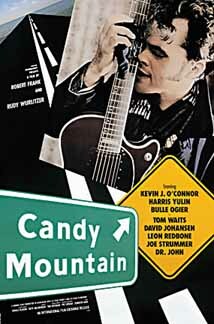 That line in Candy Mountain is typical of the film’s self-conscious obsession with the road as a myth and symbol in American life and culture. This is a film that means to be something like the ultimate road movie. And it should be, given the credentials of its creators. The writer, Rudy Wurlitzer, has practically made his career on the road, from the early hippie movie Glen and Randa to Two-Lane Blacktop. He shares the co-directing credit on Candy Mountain with Robert Frank, the renowned photographer and underground filmmaker. Frank’s most famous work may be a collection of photographs called The Americans, which captured life along the American highway. Frank also made a dizzy short movie in 1959 called Pull My Daisy, which was written by Jack Kerouac. The restless spirit of Kerouac looms over Candy Mountain, too. It’s about a footloose musician named Julius (Kevin J. O’Connor, who played the beatnik poet in Peggy Sue Got Married), who’s trying to hustle his way into the big time. When he hears that a rock star will pay big bucks to locate a reclusive guitar maker—supposedly the Willie Mays of the instrument—Julius claims to know the man, Elmore Silk, and offers to find him and bring back the guitars. The rest of the movie is his quest, which takes him through a series of misadventures. Each successive address for Silk leads Julius to another eccentric, and he goes farther north, up into Canada, until he runs out of continent. The film is dotted with musicians playing small roles: David Johanson (also known these days as Buster Poindexter) as the star who wants to buy up the guitars, Tom Waits as Elmore’s middle-class brother, Joe Strummer as a punk, Dr. John as Elmore’s cranky son-in-law, Leon Redbone as one-half of a peculiar Canadian family who enjoy imprisoning passers-by. Everywhere Julius sees the pull of the road on ordinary people, until he runs into Elmore himself (Harris Yulin), who doesn’t seem to be running anymore. Sometimes Candy Mountain states too much, but it’s a beguiling film. O’Connor easily makes his anti-hero fundamentally likable, and Frank’s photographic eye catches the subtle gradations in light and color as Julius moves from the fall colors of New York state to the mists and fogs of Canada. You might think that a movie directed by a still photographer would have a static, composed quality, but Frank goes the opposite way, to a raw, gritty sense of life. Life may not be a candy mountain, but Candy Mountain finds some unexpectedly sweet moments. I will confess it’s the kind of movie I’m a sucker for. This was before O’Connor became very unusual looking, and his interesting road led to playing Igor in Van Helsing and the man who informs There Will Be Blood‘s Daniel Plainview he has a brother. This entry was posted on Wednesday, May 30th, 2012 at 3:00 am and is filed under 1988, Actually Good 80s Movies, Music Movies. You can follow any responses to this entry through the RSS 2.0 feed. You can leave a response, or trackback from your own site.